This past Saturday afternoon was spent like so many others before it, in one of my very favorite places on earth. As I left the car and started to walk down a familiar street in what has been dubbed "The Coolest Small Town In America" I felt an excitement bordering on anxiety running through my veins. I can't quite reach the front door fast enough, yet once I'm three steps from the shop I instinctively slow down because I don't want to seem too anxious. I open the door, step inside and immediately calm down. I smell musty old vinyl records, incense burning and I hear the old floor boards shifting beneath my feet. It could be a hot summer day in 2017 or one back in 1987. Time is irrelevant because either way, I'm home. These trips went on for years until I was way too old and far too cool to be caught dead with a parent. Then I went to the record store by myself to buy a mixture of hair band and freestyle dance music on cassette. Everything from Whitesnake to Expose` was bumping through my Walkman and I never left the house without some sort of music on me. It was my happy place, my escape and my salvation I'll wrapped into one four minute and thirty second song after another. Music was my normal and for years it never really occurred to me that it was actually a gift and a language that not everyone else spoke. As I stand in front of tables full of vinyl, I'm at peace. The kind that my dad must have felt all of those years ago. The kind that you can't talk yourself into, it's either gut level there or it's not. As I pour over bin after bin, all of my real life problems seem to know better than to cut in. I'm left present in the moment and somehow connected to all of the positive things that come from melodies, harmonies and deep lyrics. Things like hope, faith, connection, joy and a reminder to my dark little heart that there is still an enormous amount of good in this world. My dad taught me how to dig for album gold and how to find comfort in something that is always, without fail, there for each and every one of us. That need to belong and fit in somewhere- it's always in the music. Most importantly, he showed me the natural connections that form while looking for that elusive record. The reality is anyone hanging over a bin of vinyl for more than five minutes will intuitively understand how at least part of my brain works, without us ever having a conversation. So why not have that conversation? Music solidifies things before people even exchange first names. 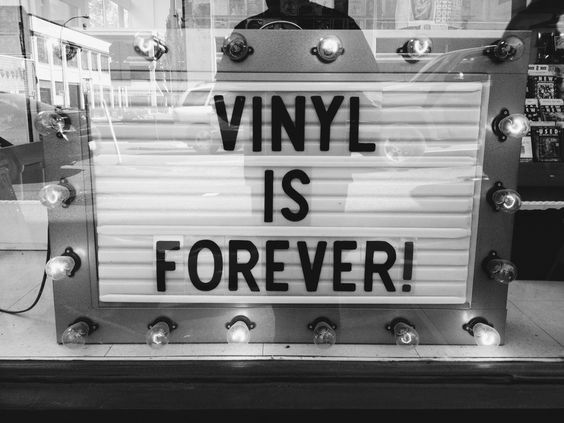 I know that vinyl has become the cool" thing again and I love the fact that my teenagers are spinning records even more than they are using a streaming service. I just hope that once the trend cools off and Urban Outfitters stops pushing the same record player in 25 colors, the love of vinyl continues with a bunch of beautiful young faces to nurture it. As a parent you instinctively understand that it's your job to provide for and teach your kids the things that they need to be decent and successful adults. As an older parent that has settled into life, I understand now more than ever that the biggest gifts that I have to give generally don't include a monetary price tag. When I watch my kids flip through albums now I wonder if years from now, they'll really get "it". Have I unknowingly lead them towards a lifetime of emotional understanding just as my father did me? No matter what your heart needs, it's in the music, so you might as well dig in.